Everyone that knows me will understand me when I say that I am a sucker for gear accessories.. This is a terrible habit to have because there is always multiple solutions to any problem and an endless buffet of add ons to choose from. And its expensive.. What makes matters worse is I just got into video, so the accessories tempting me just doubled. 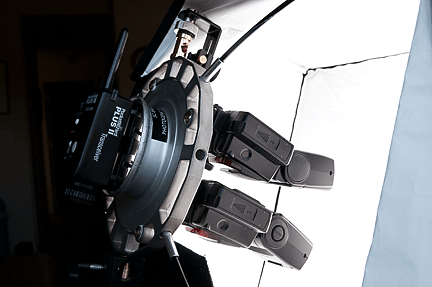 This bracket will let you use three speedlights on one umbrella, or in my case a softbox. What is the use for three using lights in one you ask? Well the answer is fairly simple, more light! 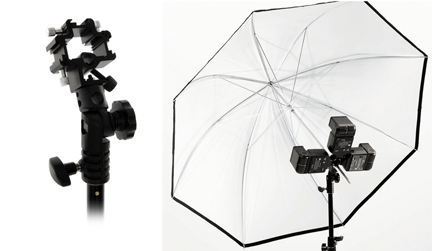 For each extra light you add to your source (umbrella, softbox, etc.) you will add one extra stop of light, assuming each flash is putting out the same amount of light. Lets go into hypothetical story mode. (Remember there are hundreds of solutions to this problem, I’m only explaining one here) We are on location at the beach. We’ve got amazing clouds above us and we want to include them in the image. Problem one, we need to over power the sun. Not so difficult, throw up your speedlight and crank it up. Exact settings depend on how dark you want the sky, how much cloud cover there is and what time of day it is so I won’t even try to give you a number. Lets say that the sun is F/8 though. Trouble is your speedlight putting out full power will only get you to F/5.6 (its a cheap old speedlight..). Now we could move it closer to our subject to brighten it up, but then it gets into our shot and we’re lazy and don’t feel like editing out a light stand in photoshop. Another solution is to add a second speedlight to the rig. Now we have two speedlights firing at full power, which gives us a reading of F/8, equal to the sun. But we wanted to overpower the sun a little didn’t we.. To get the reading to F/11 we will have to add a third speedlight also at full power. Now our sky is looking good and we can start shooting. You didn’t read the above wrong, unfortunately adding a speedlight at equal power only gives you one more stop of light.. So why bother spending the money on a second speedlight for one stop of light?? Here is the bonus. Running two speedlights at half power vs of one at full power, you can shoot faster. It should make perfect sense, speedlights recycle faster on lower settings. So if you are shooting a quick sequence and can’t/don’t want to wait for your speedlights to recycle, think about cutting the power output in half and tossing a second speedlight up there ! Three speedlights will speed up the recycling time even faster!